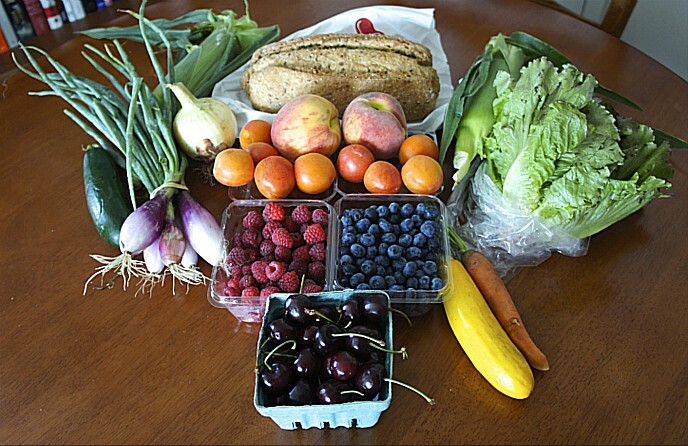 Kim Nemire, who grew up on a farm in Michigan, is a Good Food advocate who currently lives in the Washington, D.C. area and has been market manager for a suburban farmers market. 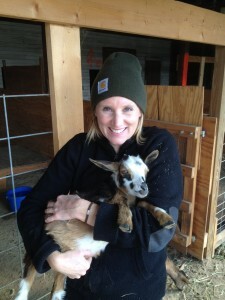 She will be relocating to Illinois for a few months to assist friend Gretta Winkelbauer on her goat farm, and will be performing volunteer duties and helping out at Gretta’s Goats‘ exhibit at the Good Food Festival in Chicago on March 21. Kim writes here about one of FamilyFarmed‘s family-friendly activities: the Kids’ Corner at the Good Food Festival presented by the Purple Asparagus organization. To learn more about the Good Food Festival & Conference and to buy tickets, please visit the event website. One thing that seems clear is that children love things that are purple. But unlike a certain purple dinosaur, Purple Asparagus — a nonprofit group that uses fun and age-appropriate activities to teach kids about Good Food — is named for a real plant that is a springtime delicacy. That is kind of the point. Teaching children from very young ages about the benefits of real, whole, wholesome food is crucial to their developing healthy eating habits as they grow up, and that is the core of Purple Asparagus’ mission. But their philosophy also is that healthy food can and should be fun, even — or especially — for kids. This is something that will be amply on display when Purple Asparagus presents the Kids’ Corner at Family Farmed‘s 11th annual Good Food Festival on Saturday, March 21. Purple Asparagus will offer children and parents a variety of healthy food-focused activities. These include entertainment by Great Scott, Miss Jamie’s Balloon-Twisting, Singing Farmhand; face painting; seed planting; a scavenger hunt; a reading corner; and arts and crafts. Purple Asparagus and the Good Food Festival have grown up together. 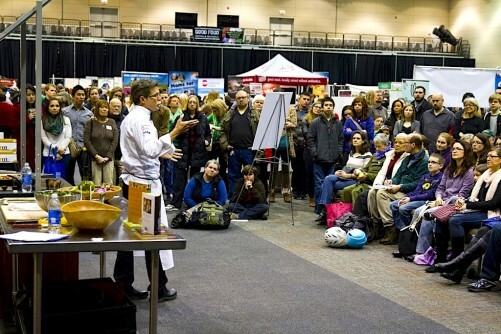 The organization got its start at the Good Food Festival 10 years ago, and has achieved acclaim and recognition since. Melissa Graham, the founding executive director and “Head Spear” of Purple Asparagus, received a Culinary Youth Advocate award from the International Association of Culinary Professionals in 2012. A year earlier, she received a 2011 Good Eating Award from the Chicago Tribune, whose other honorees have included celebrity chefs such as Rick Bayless of the Frontera group and Grant Achatz of Alinea, and as well as first lady Michelle Obama. 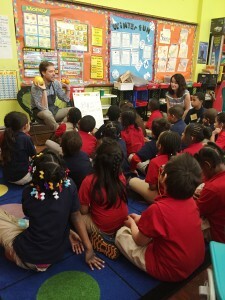 The group educates children, parents, and the community about eating that’s good for the body and the planet. Positioning kids as explorers, Purple Asparagus prevails at the nearly impossible task of getting kids to try healthy food, turning it into an adventure. Purple Asparagus’ cornerstone program, Delicious Nutritious Adventures, occurs once a month in various Chicago classrooms and is, in fact, an adventure. Burners, blenders, and even ovens are brought in during the school day to transform classrooms into a world of unexpected delights. Purple Asparagus teaches children about food in fun and interactive ways that keep kids engaged. The experience begins with an exploration of an often new-to-them fruit or vegetable that kids get to touch, feel, smell, and taste. A different seasonal item is featured each month, and even the most reluctant explorer must push his or her boundaries and take at least one “polite bite” of the star piece of produce. The second part of the classroom curriculum is a hands-on cooking lesson. Using the kid-size cooking utensils that Purple Asparagus provides, children learn to create three simple recipes from start to finish. Postcards to home take the form of recipes that parents and kids can then make together, forging family connections through shared experiences over food. Going on an adventure suggests a journey into the unknown. The great thing about Purple Asparagus is that the adventure results in kids gaining a lifelong appreciation for healthy food and the know-how to prepare simple meals that can bring family and friends together. This is an adventure worth taking. A recent evaluation by the University of Chicago showed that after completing the Delicious Nutritious Adventures program, 76 percent of students’ parents prepare the recipes at home, 56 percent of children eat more fruits, and 44 percent eat more vegetables. By turning what some kids (and, ahem, adults) would otherwise consider “yucky” into something fun, healthy food becomes more accessible. Given that 25 percent of Chicago’s children are classified as overweight or obese, it’s high time we pack our tote bags and set out on an adventure. This entry was posted in Child nutrition and health, Farm to school movement, Food and health, Food education, Good Food Festivals, Good Food Financing Fair, Good Food movement, Healthy eating for children, home cooking, School food, Sustainable food education and tagged Food education, Good Food Festival, Good Food Festival & Conference, Gretta's Goats, Healthy eating for children, Kim Nemire, Melissa Graham, Purple Asparagus, Rick Bayless. Bookmark the permalink.